The St. Giles neighborhood developed in the 1880s in what was known as Berlin Falls. Because of its early history, it became a dense urban enclave that hosted the newest immigrants to Berlin. The St. Giles area was one of the numerous areas in Berlin characterized by a strong French-Canadian presence. Several years following his death in 1883, his estate arranged to have his land…. subdivided into small, urban building lots. The survey was completed in 1888 by J.A. Pike, a local surveyor and civil engineer. 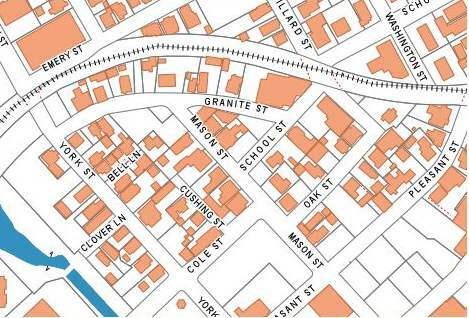 The subdivision extended from the railroad viaduct on the north side to York Street on the west and almost to Main Street on the south and east. While the lot sizes varied, the plan was likely a formalization (and attempted clean up) of an existing village pattern that had already begun to evolve there. In fact, a “birds’s eye” view of the area, published by George Norris Company in 1888, shows a significant concentration of housing along the north side of Granite Street (then known as St. Giles street), circumscribed by the railroad viaduct. During this period, many of the neighborhood’s early families were French Canadian. Hurd’s 1892 atlas, which identifies individual property owners or residents, shows most residents of the [St. Giles area] had French surnames. One example was “E. Toussaint,” who lived on Granite Street….A native of St. Isadore, Quebec, Edward D. Toussaint moved to Berlin around 1880, to work in the Forrest Fiber Mill, where he operated a paper-making machine. About 1888, his wife began baking bread from their kitchen and selling it commercially. Demand was strong enough that Toussaint soon quit his mill job and joined his wife in this cottage industry. 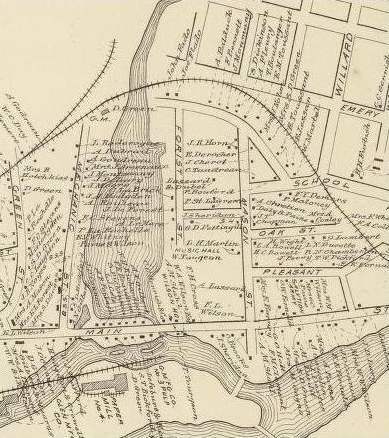 Sanborn maps show the bakery attached to the rear of their house until 1914, when Toussaint purchased a large adjoining corner lot at Granite and School Streets, demolished the tenements there, and built a large, multistory, brick building to house his commercial operation. The bakery, known regionally for its Butter Krust Bread, closed in the early 1970s. Today, the building survives … as one of the very few commercial properties in an otherwise largely multi-family residential neighborhood.